Forget about the white iPhone 4, the iPhone 5, and the iTracking scandal. The latest and greatest iPhone rumor is that Apple is prepping a T-Mobile USA-friendly iPhone. 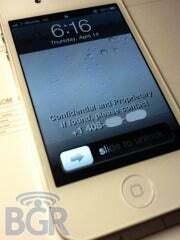 Pictures of a white iPhone 4 sporting 3G T-Mobile connectivity surfaced on Boy Genius Report late Saturday. The device is also said to be running a test version of iOS and may be powered by Apple's A5 dual-core processor that debuted in March on the iPad 2, according to 9-to-5 Mac. 3G On The Big 'T'? The iPhone jailbreaking community has been running carrier unlocked smartphones on T-Mobile for years. But hackers have been forced to use T-Mobile's slower Edge network since Apple's current handsets cannot use the carrier's 3G network. It's not particularly surprising that Apple would be looking to expand the iPhone to other U.S. carriers since ending its exclusivity contract with AT&T in February. But it is a little strange for a T-Mobile-friendly iPhone to surface now considering that AT&T announced in March its intention to acquire T-Mobile USA for $39 billion. The deal is expected to take at least 12 months to complete, and will face serious opposition from AT&T competitors and intense scrutiny from federal regulators. Nevertheless, should the deal go through, Apple would have spent all this time getting a phone ready for a 3G frequency that may not exist within the next year--at least in the United States. AT&T has already said it plans to repurpose T-Mobile's 3G airwaves for 4G service. However, prospective T-Mobile iPhone owners probably wouldn't have to worry about replacing their phones as other 3G T-Mobile users would. Presumably, the rumored T-Mobile-friendly iPhone would be able to use the same frequencies that current models of Apple's smartphone can in addition to the T-Mobile upgrade. While the device that surfaced on BGR looks like an iPhone 4, it's unclear what, exactly, this device is. BGR posits that this is most likely a prototype iPhone 4 meant to test out Apple's new T-Mobile-friendly 3G radio. Instead of launching a new version of the iPhone 4, the next iPhone may be the more likely candidate to land on T-Mobile, according to the gadget blog. But who knows? Perhaps with the so-called iPhone 5 rumored to be launching later than usual, Apple is hoping to bolster iPhone sales by releasing the device on another U.S. carrier as part of the rumored white iPhone 4 release. It's also possible Apple is simply improving the iPhone's 3G radio for markets outside the United States.